Getting your Tennessee driver's license doesn't have to be hard. 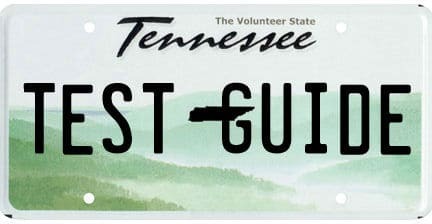 Use Test-Guide.com's free Tennessee practice permit tests to prepare for your exam the fast and easy way. Our questions come right from the source - the Tennessee DOS driver's handbook. Our free TN practice exams don't require any registration or sign-up...and give you a score report with detailed explanations. How Many Questions are on the Tennessee Permit Test? What is the Passing Grade for the Tennessee Permit Test? How Old Do I Have to Be to Get a Permit in Tennessee? How Long Do I Have to Wait Before I Can Get a License in Tennessee? What is the Minimum Supervised Driving Time Before I Can Get a License in Tennessee? How Old Do I Have to Be to Get a Driver's License in Tennessee? What Restrictions Will Be on My Driver's License in Tennessee? Is there anything else I need to know about getting my license in Tennessee? Q: How Many Questions are on the Tennessee Permit Test? There are a total of 30 questions on the Tennessee permit test. Q: What is the Passing Grade for the Tennessee Permit Test? Q: How Old Do I Have to Be to Get a Permit in Tennessee? You may apply for a permit in Tennessee when you are at least 15 years old. Q: How Long Do I Have to Wait Before I Can Get a License in Tennessee? You can get your license in Tennessee when you have waited at least 6 months after you received your permit. Q: What is the Minimum Supervised Driving Time Before I Can Get a License in Tennessee? You can get your license in Tennessee when you have had the following supervised driving time: 50 hours, 10 of which must be at night. Q: How Old Do I Have to Be to Get a Driver's License in Tennessee? Q: What Restrictions Will Be on My Driver's License in Tennessee? Q: Is there anything else I need to know about getting my license in Tennessee? Learner’s permit holders in Tennessee may not drive from 10 p.m. to 6 a.m.
Disclaimer: Not affiliated with or endorsed by any state government agency.